Jargon getting you confused? Need to understand what these terms mean? If the answer is yes then you need our Free Digital Signage Glossary. Experience taught us that common terms for digital signage professionals are totally unfamiliar to people outside the industry, especially end- users. So the motivation behind launching this material was to help all those interested in digital signage to understand its terminology. 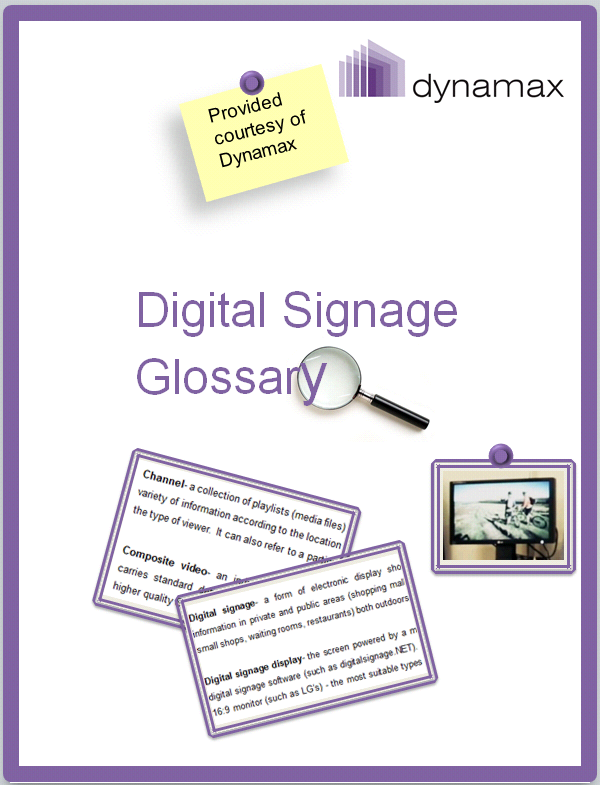 There are a few comprehensive digital signage glossaries out here, especially those released by industry associations. However, this particular one contains terms specific to our cloud- based digital signage software and it’s meant to enhance the user- experience of our current and prospective clients. Aimed at enhancing a person’s overall understanding of the digital media signage terminology, the 62 word- glossary explains terms related to all aspects of the system- software, hardware, installation with a particular focus on the content management- side of things. So expect to find definitions of terms such as: composite video, audit trail, HDMI, media player, SMIL (device). Also, if you’ve ever wondered what does letterboxing, screen zoning or HTML5 means and imply- then this is the glossary for you. The material also provides references and links to ther resources that those wanting to learn more about a certain concept defined might find useful. So if you have an interest in digital signage systems, feel free to download the paper by clicking on the image below. This entry was posted in Digital Signage and tagged #avtweeps, #digitalsignage, #proav, Chatter, digital signage by Dynamax. Bookmark the permalink.